In 2012 world consumption of uranium was 165 million pounds versus 152 million pounds of mined uranium production. Globally there are 434 nuclear reactors operable, 67 reactors are under construction, 159 are on order or planned and 318 are proposed. 1. Nuclear power generation is being ramped up across the globe. 2. Japan is restarting its reactors. 3. The Megatons to Megawatts deal, the HEU agreement, is coming to an end. Global uranium stockpiles have been filling the gap between consumption and production for more than two decades. By far the largest contributor has been the Russian Highly Enriched Uranium (HEU) agreement, providing 24 million pounds of uranium to the market every year. However, secondary supplies are drying up and the HEU agreement is coming to an end in 2013. Cameco (one of the world's largest publicly traded uranium companies) estimates world uranium demand will increase to about 240 million pounds by 2022. The U.S. is in an especially dire situation in regards to the security of its uranium supply and the situation doesn’t look set to improve through exploration or new mine development anytime soon. Employment for uranium exploration in the U.S. was 161 person-years in 2012, a 23 percent decrease compared to 2011. The long lead time of uranium mine development - up to ten years - means that the industry is unable to respond quickly to sudden increases in demand or significant supply interruptions. With the recent lower uranium prices, delays and cancellations of new projects is becoming the norm and exacerbating the coming global and U.S. supply crisis. Ten percent, or just 4.9 million pounds, of the 49 million pounds U3O8e uranium loaded into U.S. civilian nuclear power reactors during 2012 was from U.S. mined uranium, 90 percent was foreign supplied uranium. According to the World Nuclear Association (WNA) there are plans for 13 new reactors in the U.S., three reactor units are under construction, and as many as six may come online in the next decade. Expect uranium spot prices to start climbing to equalize with long term prices and then both to begin a rapid advance as the supply squeeze starts to be felt. Crisis in the Congo is giving ahead of the herd investors an exciting investment opportunity. Between an outright ban on the export of raw minerals, project ownership grabs, power shortages and armed conflict the DRC’s resource sector is imploding. Most of the DRC’s cobalt goes straight to China who refines it and sells it to the world, a major amount – 20 percent - goes to the U.S. which imports 85 percent of its cobalt needs, expect both countries to be screaming for cobalt as a supply crunch gets underway because of the ongoing Congo drama. The supply sides of both cobalt and uranium are shrinking while demand increases and security of whatever supply there is, is far from assured - perfect storms that bode well for investments in both cobalt and uranium. 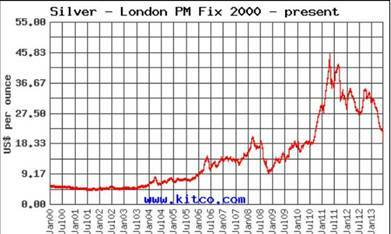 Silver bullion sales are constantly breaking records, high premiums over spot are not fazing buyers. Sales of silver coins by the U.S. Mint (one of the world’s top producers of gold and silver coins) have set a record high in the first half of 2013. That’s the best start to a year…ever. Here’s a question worth considering – when was the last time you heard of a bull market ending, in any commodity, let alone a money metal like silver, with a period of sustained, record physical demand two years after peak prices? Michael Kosares, of usagold.com, has put to together this excellent chart and his short commentary follows. The high-to-low down moves in gold and silver we’ve recently witnessed are very close, percentage wise, to the down moves we saw in 2008, if the precious metals bull market corrective phase we have just suffered through has bottomed, silver will, much sooner than later, soar. 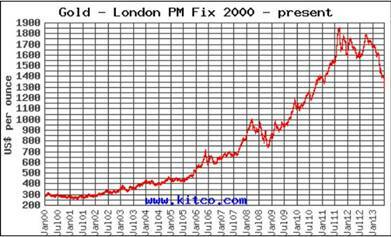 From January 2000 gold went from $300.00 per ounce to almost $1,900.00, while silver, in the same time period went from roughly $4.50 to almost $46.00. 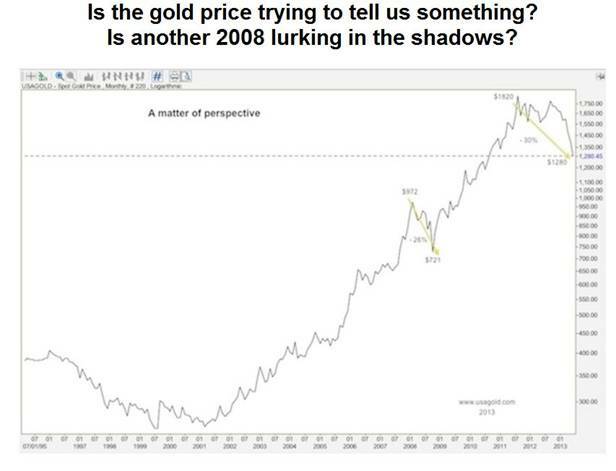 As you can see from the above charts the bulk of gains were captured from the end of 2008 to the peak prices, in both gold and silver, in the summer of 2011. Gold’s gain from roughly $750.00 to $1850.00 was impressive but even more impressive was silver’s gain – from just over nine bucks to $46.00. It’s pretty obvious why, after reading the above pages, I’m a huge fan of, in no particular order, uranium, silver and cobalt. Demand for uranium and cobalt isn’t going to disappear anytime soon, these critical, and yes strategic, green energy metals are just as necessary to the functioning of a modern economy as the water we drink to survive. Silver bullion demand is soaring because it is a monetary, industrial and miracle medical metal whose current investment potential returns from here look tremendous. Demand for the three are going up, supply is not going to keep pace, currently the junior resource companies that search for and develop deposits of these minerals are severely undervalued and out of favor with investors. How can this not be a good situation for investors? Shouldn’t all three sectors, and the quality, moneyed up, junior resource companies (who are still extremely active developing their projects and increasing shareholder value), be on all our radar screens? Are they on yours? Richard does not own shares in any company mentioned in this article.